Many students are worried about speaking part 3, however, If you know some of the common patterns to the questions that come up, then you will feel much more confident in this part of the test. One point I must make however is to never memorise answers, just speak in a natural way and do not self correct, focus on fluency. Yes grammar is important because it’s in the marking criteria, but I have coached many IELTS students and they worry far too much about being very grammatically correct. There is a simple structure for all question types in speaking part 3. first state your topic or opinion, explain then give an example. Most people will introduce their opinion with ‘I think….’ However, you need to give more variation in the way you express an opinion. The examiner will be looking for this. Here are some expression you can use for introducing your opinion. As far as I’m concerned….. If you ask me I think…. To be honest I think…. Note that you should not use these in the writing part of the test as they are too informal. In some cases we may want to contrast our opinion with the public opinion so you can use these expressions. It is often said that…. If you are not sure or don’t have a clear opinion never just say ‘I don’t know’ , use these expressions below they sound much better. I haven’t really thought about it, but I reckon…. It is not something I have considered, but I guess…. To be honest, I don’t really know, however I would say…. In the examples above, you state that you do not know but you can still give some kind of opinion. If you want to make your opinion sound stronger you can use these expressions. I am absolutely certain that…. Question: What do think about the way languages are taught in schools? Response: As far as I’m concerned the methods used to teach foreign languages in schools are in need of improvement. Teachers need to engage students more with interesting materials and fun activities with real life conversations in that language. It is widely believed that teaching just grammar or lecture based lessons are not effective and I agree with this. For example, when I was in school I didn’t like French class as the teacher just lectured and there were no fun group activities. The main part of giving a good response is to make sure you give detail in your answer and most importantly an example. When presented with a question about the future we should respond with ‘will + verb’ or ‘will be + gerund’ but there are other patterns that you can use to show your ability with language. It is highly likely /unlikely that…. It is not very likely that…. Question: Will computers and robots replace teachers in the future? Response: I reckon it’s highly likely that robots and computers will be used in schools rather than teachers. If technology continues to progress at this pace, then I can definitely see that teachers in the classroom will not be needed in the future. 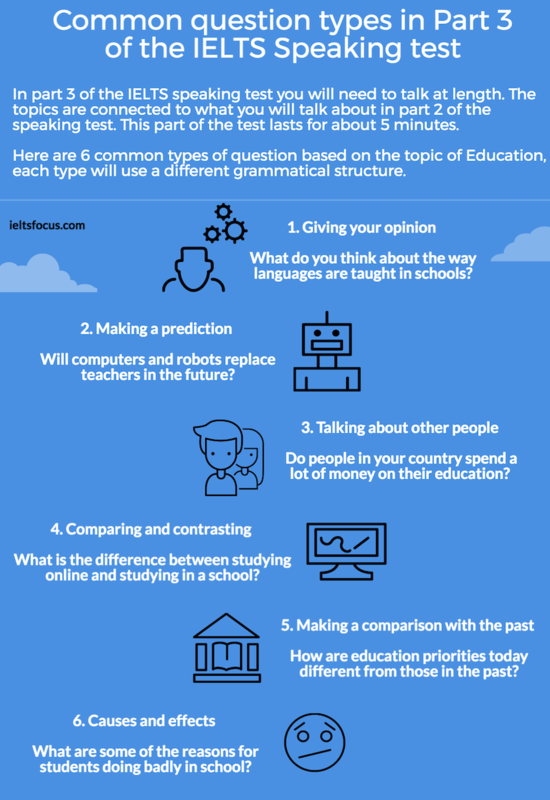 For instance, I recently read a report in the Guardian newspaper that Japan is planning to put robots in English classrooms to help pupils with their pronunciation, so yes there is a strong possibility that robots will be doing the job of a teacher within 10 years. Often you will be presented with a question where you will be asked about other people. It is a common mistake to just talk about your own experiences or someone in your family or friends.. This kind of question is asking for your ideas about people in society. People in the past used to…. Question: Do people in your country spend a lot of money on their education? Response: I would say that the majority of people spend a lot on education. Traditionally in my country, studying hard to get into a good university is considered to be very important. For instance, most people want to get a job as a Doctor or some other high paying profession, therefore, many people tend to see investing in their education as a big priority. In this type of question we will need to use comparatives and superlatives to compare two or three things. We use comparatives to compare two things or two people. Question: What is the difference between studying online and studying at a school? Response: Studying on the internet such as an online course is more effective than studying at school, because we can focus more without the distractions of being in a class. We can also study at our own pace and with recent advances in technology, it is often much cheaper to study online than at a school. For instance if you want to learn English it will be more expensive to enroll in a school than studying through Youtube videos or taking a Skype lesson. 5. Making comparisons with the past. When comparing the past we can use comparatives and superlatives with the past simple, past continuous, used to, present perfect continuous or the present perfect. Some example sentences about education using this grammar. Past continuous: Truancy was becoming a big problem when I was school, although these days it seems to not be such an issue. Question: How are education priorities today different than those in the past? Response: Many years ago teaching was about rote learning and the pupils used to listen to the teacher in a lecture format. In recent years in the western world especially, there has been more of a focus on individualism and critical thinking skills. For example, when I was in high school I remember the teacher was writing up stuff on the blackboard with no group discussion among the class. These days the classroom is a very different place. In this type of question you will talk about what the causes are for something and the effect it has. Pollution and smog are a result of coal fired power stations and Co2 from vehicles. Global warming is partly due to the burning of fossil fuels in developing countries, consequently, weather patterns have been changing worldwide. Many school children are doing badly at school. This is down to various issues, bullying, boredom and poor teaching methods. As a result, the pupils are not getting the grades they need to go to University. This can be attributed to…. Question: What are some of the reasons for students doing badly in school? Response: I feel that this is down to a number of issues, among these are poor teaching methods, boredom and lack of motivation. This means that many students are not getting the grades they need to enter University. For instance, when I was at school I had to study geography and science but I had no interest in those subjects. Also I realised that the teaching methods in my school were not so good. Due to this I completely lost interest in those subjects and got poor grades too. You have to be able to talk at length and most importantly explain why you feel the way you do about a particular topic. You also need to give an example in each case. In all my model responses above I have stated the topic, explained and given an example. The example that you give does not have to be statistically accurate and it can be a personal example from your own experience. Note that the IELTS speaking test is in informal tone, some of my examples are a little bit formal but they don’t have to be. 3 Steps to a good response. Developing your ideas with good fluency will go toward getting a high band score. There are many cases of students with good grammar and vocabulary who go into the IELTS exam and end up getting Band 6, all becasue they lost confidence and couldn’t develop their answers. Develop your confidence and have some kind of strategy to deal with your stress levels in the exam.